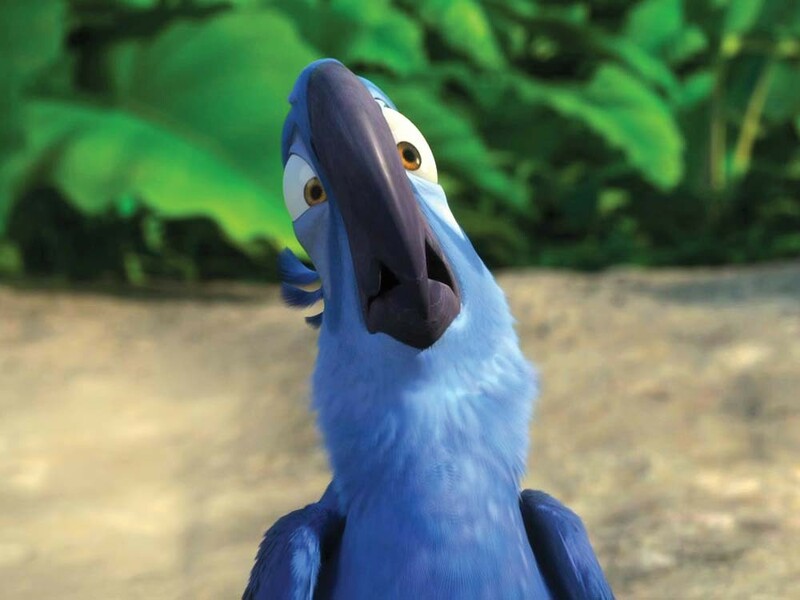 Rio is the kind of movie that makes preschoolers giggle and grown-ups seethe. "This turkey can't fly," says the movie's poster. Can't say we disagree. There´s a market for this kind of film: Young moviegoers love lots of action, bright colors and funnylooking characters, accompanied by a shell of a story that’ll be forgotten before the empty popcorn containers are tossed into the garbage. Oh, and songs. Lots of songs, wedged into Rio with unerring regularity, all of them sounding pretty much alike, none of them doing anything to propel the story. Like the popular trio of Ice Age films (which were also directed by Carlos Saldanha, and which pulled in more than half a billion dollars domestically), this new piece of animation is slick, simple and soulless. The plot: Poachers steal exotic birds in Brazil, sell them in Middle America. Blu, a baby blue macaw who can’t fly, is found by Linda, a little Minnesotan girl who grows up to be a woman with no social skills and has become the overprotective owner of Blu, who tends to over-think things. Idiotic Brazilian ornithologist shows up in Minnesota, begging Linda to bring the rare macaw to Brazil so it can mate and preserve the species. Adventure, romance, wise-cracking birds — and, oh yeah, those songs — ensue. As do strong anti-smuggling and pro-racial parity messages, both of which will go soaring over the heads of the film’s intended audience: very young viewers. Yes, this one’s for the kiddies. Its chance of holding the attention of anyone else? Very, very low. Hold on, there is that one point where heroic birds are fighting off villainous monkeys, and one of the birds shouts, “Yippee-ki-yay, monkey man.” I’d guess that not many 3-year-olds are going to get the Bruce Willis Die Hard reference. It doesn’t matter. The kids’ll be wrapped up in the film’s bursts of action and the good-looking but not outstanding 3D effects. They probably won’t be critiquing the voice performances. But I will. Since Blu is a nervous Nellie of a bird, it must have been a snap to decide on hiring Jesse Eisenberg for the part since, at least before The Social Network, he specialized in that type of role. But his delivery here is flat, dull, uninspired. Blu is to be matched up with Jewel, voiced by Anne Hathaway who, similar to what she pulled off as an Oscar host this year, is a tad too over the top. Yes, after their capture in Brazil, it’s easily understood that the domesticated Blu has grown fond of the safety and comfort of captivity, and the feisty Jewel just wants to be free. But the differences in the two characters could have used some balancing. But there’s no time for any of that. The film must constantly rush forward, filling the screen with unimportant ancillary characters, including animals voiced by Jane Lynch, Wanda Sykes, Jamie Foxx, George Lopez and Tracy Morgan. They’re here either to crack wise or sing another song. While rushing forward, at least there’s a fragment of drama involving strife between Blu and Jewel. And there’s always room for a song. But, hey, that song at the end is actually the same song from the beginning. Great. A dearth of ideas, along with similar-sounding songs in rotation. Birdbrained!